Whenever I cycle down the Voie Verte from Chazelle to Cluny (formerly a railway, now a cycle track), somewhere half way I pass by a rather strange building. Just past the former station of Massilly lies an old farm, and half of the farmhouse seems to be an old church. 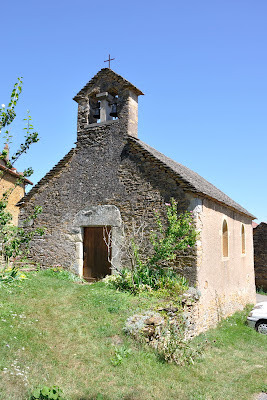 The church-like building appears to have been the church of Cotte, a hamlet belonging to the commune of Cortambert. The pointer on the map points to the restaurant "Au Pont de Cotte"; the church itself lies approx 200 m to the east, on the other side of the old railway. This was the church that once was home to the baptismal font in the chapel of Collonges (see the previous blog), although I did not know that at the time. When I told Eduard about this church, he acknowledged having heard about it, although he did not have pictures of it. We are again talking ancient history, because now one can find my pictures on this page. 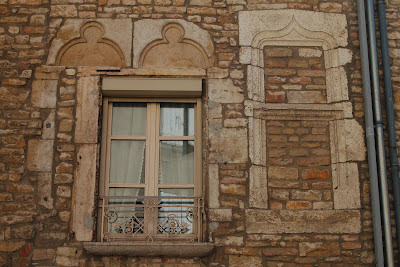 A similar building can be found only a stone throw away from our house. This farm lies approx. 800 m south of the pointer (La Tuilerie de Chazelle). The chapel is built against a farm house, the ferme de Coureau, and it is part of the village of Bray. We found out about this chapel through one of our campers who did a walk in the vicinity, and accidentally stumbled upon it. 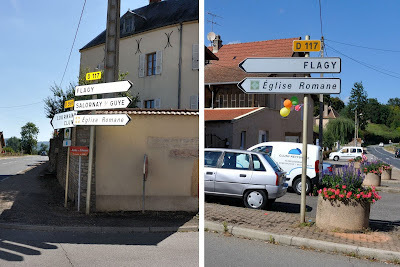 The last signpost to something Romanesque, along the road between Chazelle and Cluny, refers to “Collonges Chapelle Romane”. 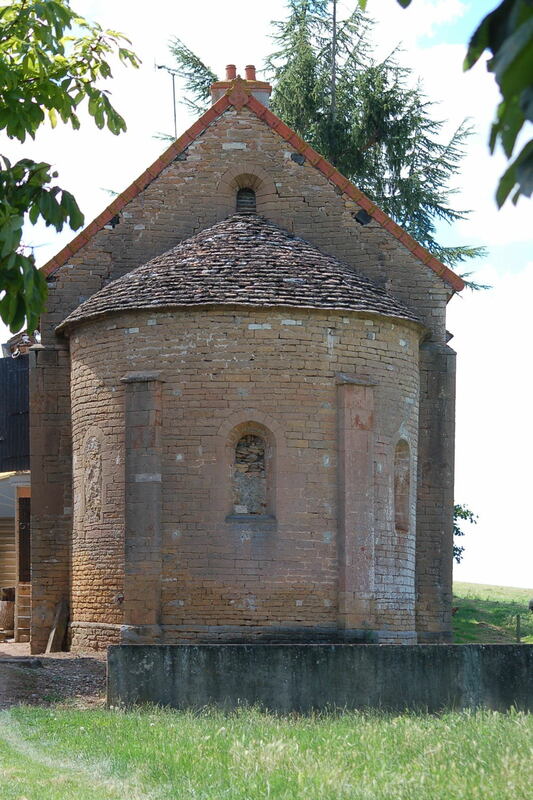 This chapel is a cute little one, in the hamlet of Collonges (commune of Lournand). Inside the chapel there are some drawings or paintings made by Michel Bouillot (1929-2007), a writer and well known artist who has made pen drawings of almost each stone in every Burgundian house in our department. 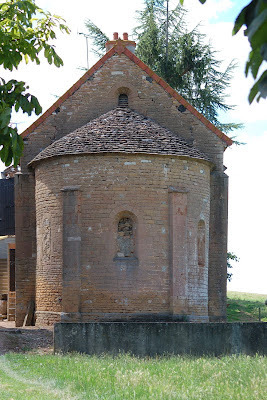 I seem to remember that there was no reference to this chapel on le site sur l'Art Roman en Bourgogne, but I cannot reproduce the correspondance between Eduard and myself on this subject. 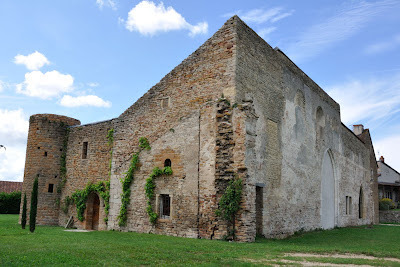 I think that I sent him some pictures of this chapel, and that his answer was that he could not find anything Romanesque on the photographs, and hence that the chapel did not qualify for an entry on his site; it was simply not a Romanesque chapel. 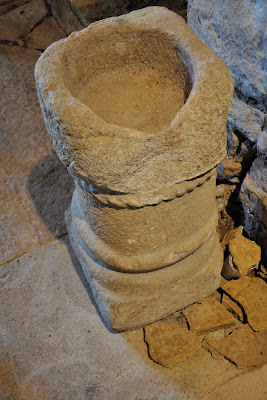 However, when I sent him another photograph of an information panel I had found in the church, where it was explained that the baptismal font in the chapel originally came from the Romanesque church in Cotte (in the commune of Cortambert), he changed his mind. As of then Collonges is mentioned on his site, albeit in the category 1 or 2 stars. Lournand appears to have more to offer then the church, chapel and castle from the previous blog! 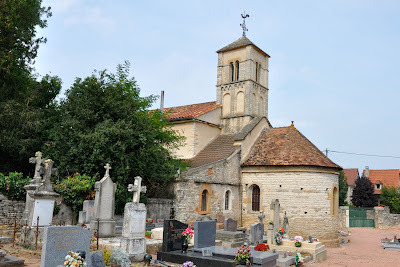 I found a reference to a former church Saint-Odilon in Cluny on the website le site sur l'Art Roman en Bourgogne, a church with one or two stars. 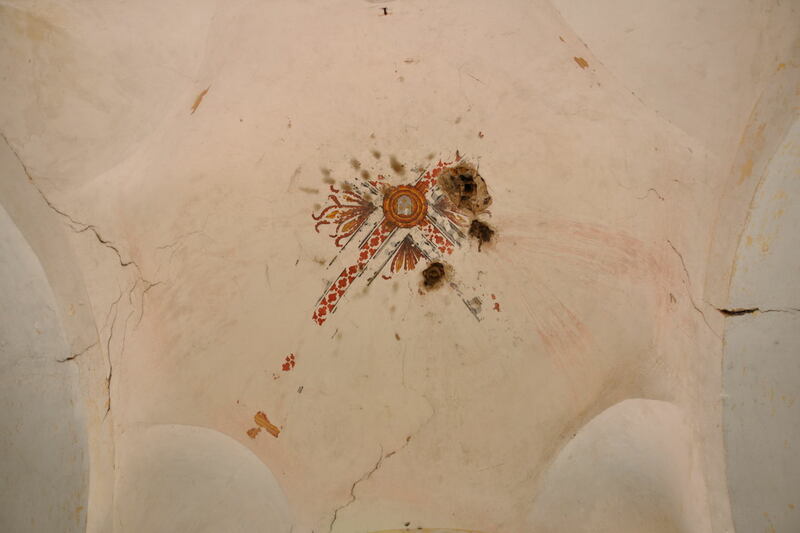 The site distinguishes buildings with a number of stars, ranging from 6 to -combined- 1 & 2 stars. 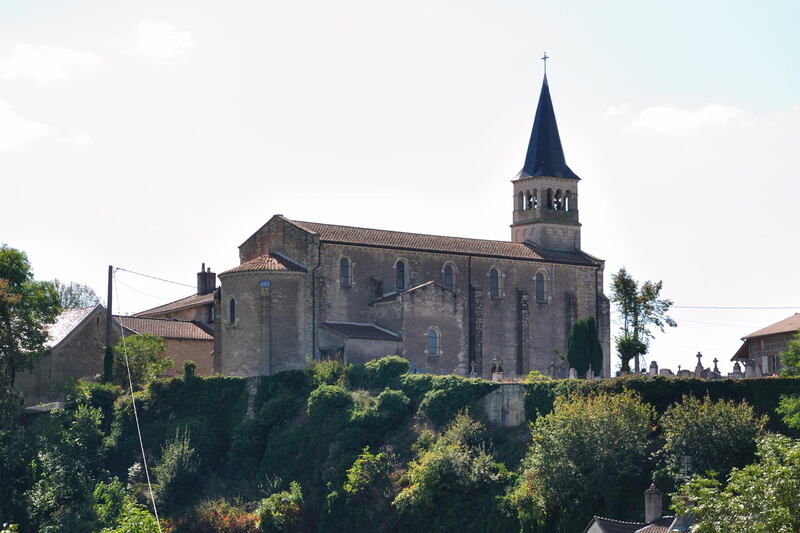 For reference : Cluny III has a 6 star rating, the bit of church wall in Bonnay has a 1 / 2 star rating. 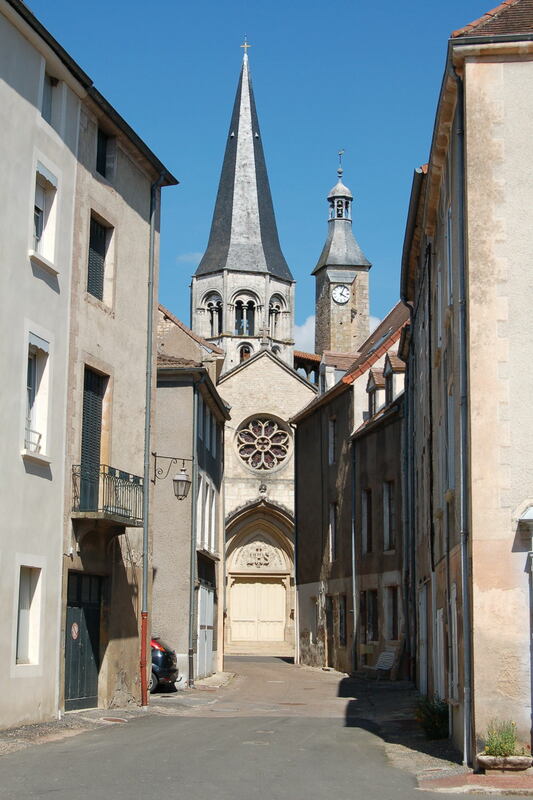 We know Cluny quite well, but I had never heard of a Saint-Odilon church. 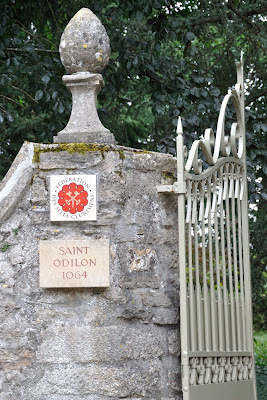 However, we knew the Saint-Odile gate, or Porte Saint-Odile. 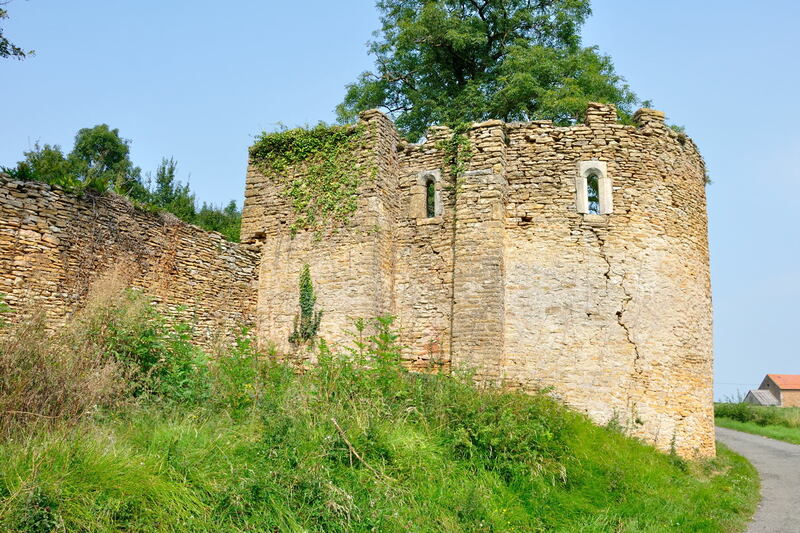 After consulting Eduard van Boxtel we learned that what he mentioned on his site were the remains of the choir of a small church, mentioned for the first time in 1075. 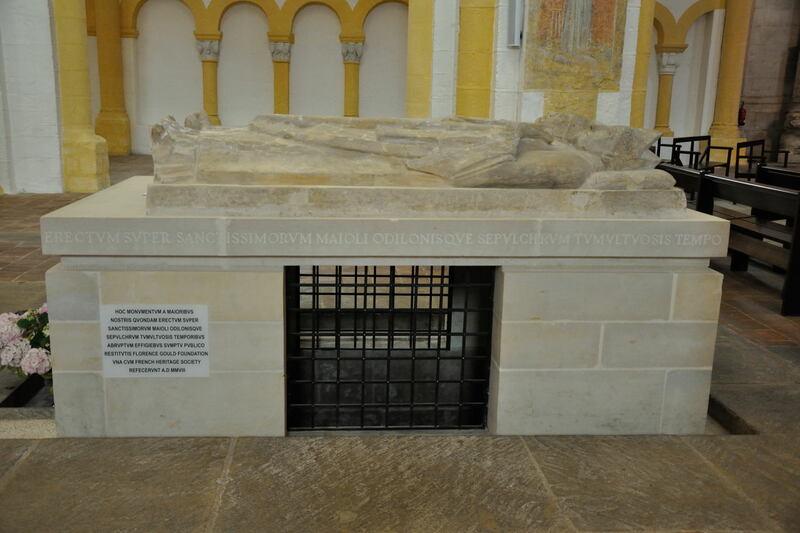 The chapel is dedicated to the 5th abbot of Cluny, who died at the end of 1048 or beginning of 1049 during a visit to the priory of Souvigny (03). Saint-Odilon shares a grave there with his predecessor Saint-Mayeul. Only after I received more information about the location of this "church" the penny dropped. The "church" was a bay of the choir, located inside a private house along the Rue du 19 Mars 1962, just outside the Gate Saint-Odile. Did we not, long time ago, visit a private house around there, on one of the Journées du Patrimoine, which opened to the public just for those days? And were we not a bit cheesed off then, after having paid € 1 in order to have a quick look at the remains of some Romanesque columns, capitals and arches half built in a wall? It was not so difficult to retrace our steps, even though we went there several years ago. In the meantime the gate was equipped with two signs, one saying “Site Clunisien”, the other “Saint Odilon 1064”. This was indeed the house we had seen before. The question was: how to get in this time. I walked towards the house and saw that somebody was home; I started pacing up and down, in the hope that someone might spot me. That happened quickly. The owner came outside, asked what we were doing in her garden, was happy with my explanation that we had seen the signs, that we were very interested in Romanesque churches, and that we would be very grateful if we could actually have a quick look inside the house. When she asked how we knew about this church I fibbed, telling her that we were on holiday on a quest for Romanesque churches. I must have hit the right note, because we were asked in, and I even could take some pictures, with the restriction that I would not publish them on the internet. And funnily enough, this time it was different. 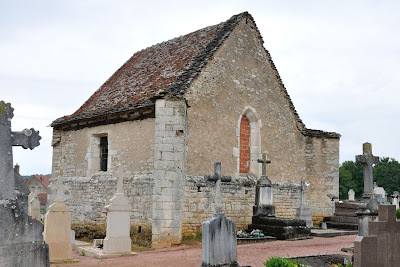 We knew that we were looking at the remains of the oldest still existing church in Cluny, and that made it just that little bit more interesting than the first time we saw these remains. A promise is a promise, hence I cannot place any of the pictures I took there in this blog, other than the ones everybody can take from the public road. As compensation however this blog has pictures of the Porte Saint-Odile and of Saint-Odilon's and Saint-Mayeul's grave in Souvigny. For those who cannot wait till the next Journées du patrimoine (early September) : the owner is a very friendly woman, and she was more than happy to show us around. My little white lie however is still haunting me every so often. Since our second visit to her house I have bumped into her on several occasions, ducking away each time just in time. Because I would feel really stupid to be tackled for this little fib. So every time I am walking through the streets of Cluny I am ready to duck behind someone else, a tree, a pillar, just not to be seen by her! 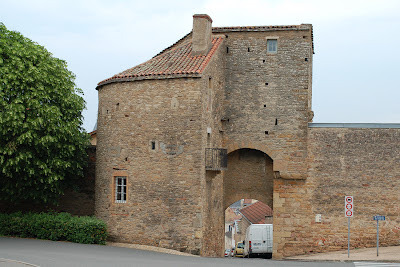 As I have mentioned before, the website "le site sur l'Art Roman en Bourgogne" offers a big variety of data on the subject. Reading through the churches in the vicinity I stumbled upon Bonnay, a village just down the road. 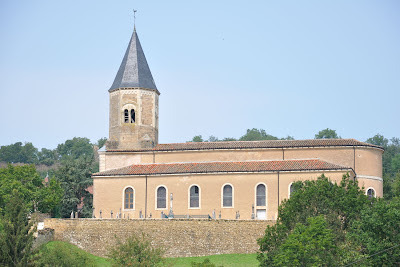 The site mentioned about the church : dedicated to Sainte-Marie; a former church; a building that does not rank very high when it comes to impressive architecture. I am not a Roman Catholic, and I am certainly no expert when it comes to architecture. Despite this I think that even a lay man can see that this church cannot be much older than 150 year. And to which Saint this church could be dedicated is something I certainly could not even start to guess. Eduard van Boxtel held the key to this mistery. The building of this church (the Sainte-Marie) commenced in 1881. 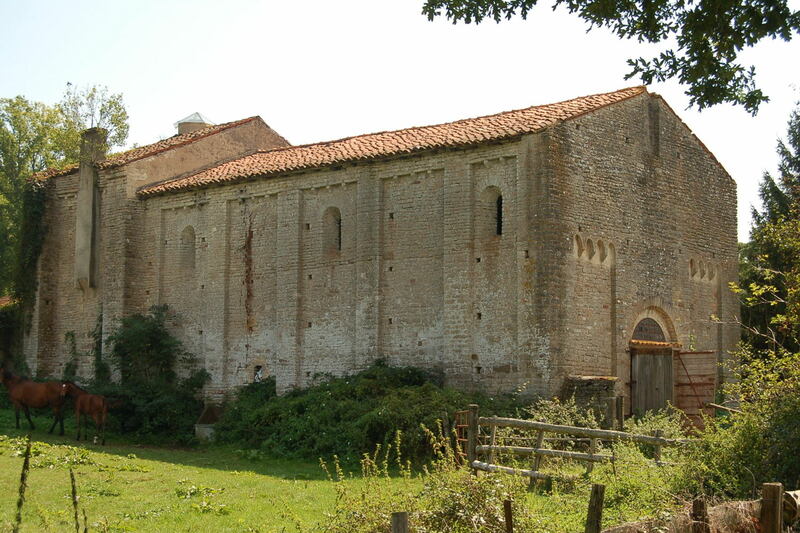 However, before that time there had been another Sainte-Marie; the original church was demolished at the end of the 19th century. 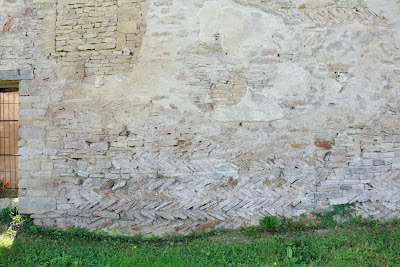 The only thing that rests was a piece of wall, with stones laid in a herringbone pattern (this is called Opus Spicatum by those in the know). I like puzzles, but how does one find a piece of wall with a herringbone pattern? The pattern I knew from other churches, like the Saint-Laurent in Tournus, but was it hidden in the wall of a residence, or in the wall of the new church? In a word, how does one find this bit of wall? 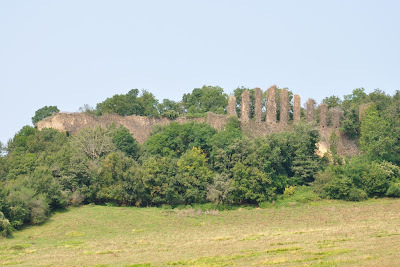 First we asked some friends who lived near Bonnay, but without success. Next we found out that the mairie of Bonnay was open on a Tuesday morning, so that was the day to go there. 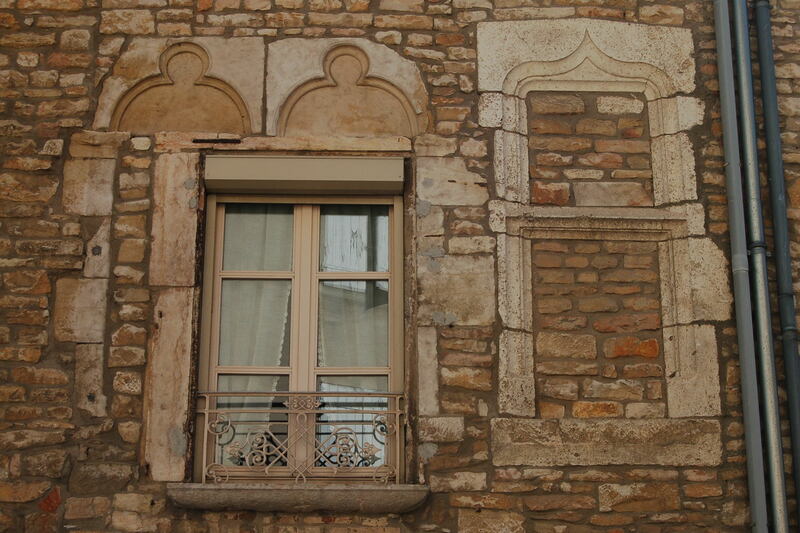 Fortunately the mayor was at the mairie, and he knew where to find this wall. According to him it was a piece of garden wall at the Place de l'église, near the new church, on a little border with some shrubs. The mayor made it very clear that all resemblance with a proper church would be purely coincidental. 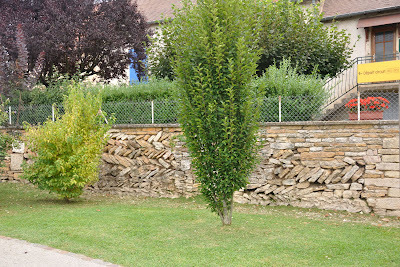 Anyway, we went to the Place de l'église and found a small garden wall, not even 3 feet high and a couple of yards long, in which the herringbone pattern was easily recognisable. For all my photographs on the subject, click click here. One thing is sure; if there are more of these hidden or lost churches around here that need to be found, we will not become bored very soon! Why not still another blog? 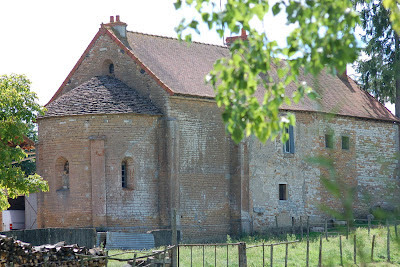 Quite some time ago I stumbled upon a website about Romanesque architecture in Burgundy, le site sur l'Art Roman en Bourgogne, which is a subject I am certainly interested in. This site (in French) suggested that it was an inventory of every Romanesque church in Burgundy. Please note the word every! 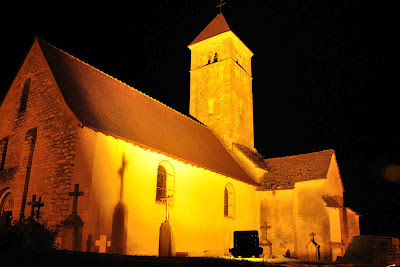 My first impulse was to look up the church in our own village, Chazelle. Not being hampered by lack of patience I could not find Chazelle, at least not in the alphabetically ordered list of thumbnails of churches, hence I decided to contact the web master of this site. 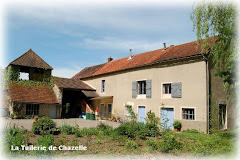 Mr. van Boxtel, a Dutchman running this site answered promptly; below the list of thumbnails were more lists (only text) of churches in this area, and lo and behold, Chazelle was mentioned there. 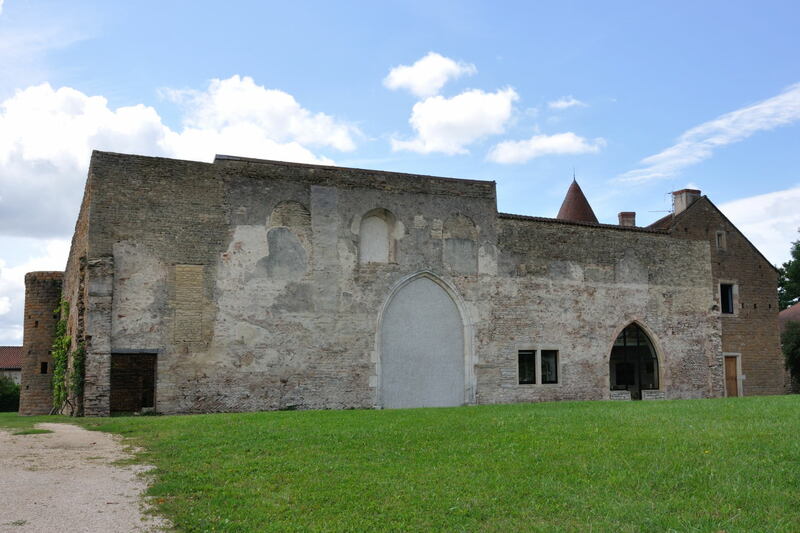 I found soon out that if there was a thumbnail shown on the site, there were more pictures of the church available; was a place only mentioned in the lists there were no pictures available, at least not yet. Obviously then there were no pictures for Chazelle (now there are!). Since that first set of emails I have been in regular contact with Mr. van Boxtel, and we have found consensus with respect to how we could benefit from each other. 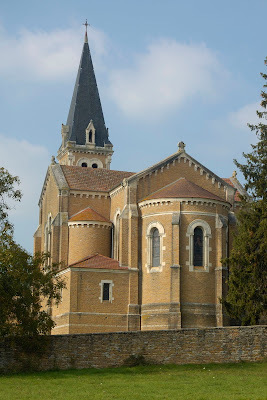 If I have questions on the subject I can ask him, and in exchange he has by now received all the pictures I have ever taken of Romanesque churches in mainly Saône-et-Loire. So bit by bit my knowledge increases and his site becomes more and more complete. This way everybody is happy! During our contact, which is still continuing, Mr. van Boxtel posed the question whether I was going to do "anything else" with my own pictures in the future. I had never given that any thought, apart from using some photos in an occasional blog, but his question made me think of writing a blog about the lesser known churches in the area, and mainly the ones which are mentioned on his site, but of which he does not want to (for whatever reason) publish any pictures. And that is what the next blog posting will be about!